To ease the burden for low income families by equipping their children with the necessary supplies to feel empowered on their very first day of school. We want to partner with parents to set their children up for a successful school year by serving these families with the dignity, privacy and respect they deserve. As future leaders, business people, professionals and labourers all children need the right equipment and tools in their hands today. Our goal is to reach and help all those in need here in our local community and to spread to other communities. The collection runs from July-September each year with help from local businesses, residents and community groups. We support groups and businesses with fundraising and work with those who want to volunteer their time and efforts. Preparing a child for back to school with backpacks, supplies, forward and clothing is a huge expense, particularly for families with multiple children. If we as a village can come together to help with the backpack and supplies we will have helped a family in a huge way. How do the backpacks get to the children and families? We work alongside trusted organizations and groups who have first-hand access to families in need, or work with low-income families who put a list of needs together for us. Priding herself on her independence, it wasn't easy for Sally to call us two years ago. Having just left a difficult situation she knew she had to reach out for help. Her son was all set for the upcoming school year and he “felt just like all the other kids.“ Sally was delighted with the help she received. 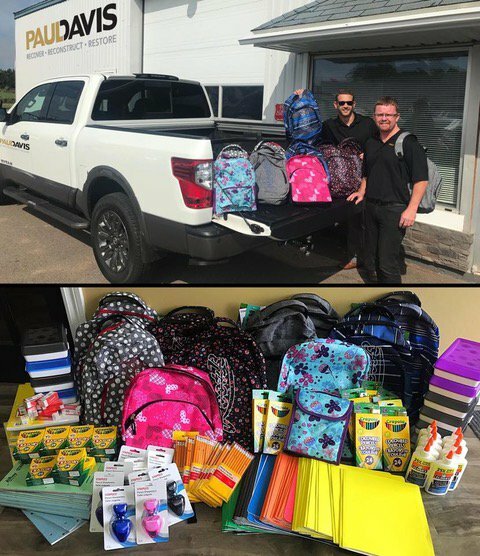 The following year there was a knock on the door of one of the Operation Backpack contacts and there stood Sally and her son with a ton of supplies to donate to the project. They paid it forward because they felt loved and respected by our village and wanted to share that love. Donations of any type of school supplies, backpacks for all age groups or monetary donations are greatly appreciated. If you are a business wanting to partner or participate in any way we would love to talk to you.